The customer is always right, right? Well, it all depends on what kind of experience customers have with your brand. Their experience will not only dictate how often they’ll complain, but how successful your company will be. Think of some of the biggest new brands – ones like Google, Facebook, Netflix, Amazon. All started within 15-20 years, but all have seen incredible success. Want to know why? Because they spent a lot of time and money making the customer experience the best it can be. Exclusive Bonus: Download the free cheat sheet of tactics big brands use to create a personal experience, and software to do it on a budget. Recently, taking the customer experience to the next level is possible through personalizing the content. It’s been an important cornerstone of successful marketing for some time now. Think back to how this got done before the web. Companies were talking to customers, giving them surveys to try and find out as much as they could about them. These days companies have a wealth of knowledge at their fingertips, and are embracing data to make it work for them. This article will explore how four companies (Amazon, Netflix, Google, and Best Buy) adapted over the past five years to see amazing growth, largely because of personalization. This company needs no introduction, and I bet you can already start to connect the dots on how they’ve managed to leverage personalization to great success. First, we need to take a step back and understand how Google makes its money. 89% of it comes from ad revenues, so for all intents and purposes, we’re only going to focus on that. So the question is, how do they leverage personalization to see the 66-billion-dollar revenue they pulled in last year. Google works best as a profile-based service, which means that to get the most out of it, you’ll need to sign into an account. From Gmail to YouTube, Google accounts work with a lot of services that people use regularly. Sure, you can still use it without signing in, but that is where the real personalization begins. This first point is pretty obvious. Depending on what you search for, and what your browsing history is, Google will serve you different sites. Despite this fact, most people still don’t mind using it. By knowing what you’re searching for, they can offer products they think you’ll want to see. Yes, they are skewing the data. If you want a completely unbiased web search, consider using something like duckduckgo.com. Google is banking on a complex algorithm that takes sites you’ve visited and continues to show similar ones. If they know the type of sites you enjoy, why not show you more of the same? This takes the first point to the next level and is made obviously clear after searching for a specific topic that you wouldn’t usually search. As an interesting experiment to illustrate this, I changed up my searches for a week. I love cars and do a lot of car-related searches. Understandably, most of my ads (when ad blocker was turned off) were for car-related products. I tried searching for something completely unrelated to cars: bird watching. Google noticed and then started showing me tranquil ads for bird watching equipment. Anyone can run this experiment, and it’s interesting to see how your search affects everything around you. Though this may come off as creepy to some, it makes sense. If I am genuinely interested in all this bird watching stuff, maybe a company is offering a sale on those killer binoculars that I was looking for; so, I’ll click an ad, Google will get paid, and I’ll have some nice binoculars. Thanks, Google! This last example is the natural progression from search and ad personalization. Since Google owns YouTube, it’s already happening. Depending on what you usually watch, it will curate your content to show you related videos. Though most, or all, of us, hate video ads, they know it’s a numbers game. Sure, you may close an ad every time, but 1 in 100 people might click it, and 1 in 1,000 might go on to buy the product. With these ads being served to millions of people every day, there is a lot of money to be made. Google has mastered personalization to try and give you what you’re looking for before you even look, and the numbers speak for themselves. If this approach weren’t working, they wouldn’t be doing it. Next, let’s look at everyone’s favorite streaming site: Netflix. “Netflix and chill,” may be a popular saying, but they are not chill about their dedication to providing you with shows you want to watch. Unlike Google, Netflix doesn’t make their money through ads, but through subscriptions, so their main focus is retention and keeping existing customers happy. They do this by filtering through their sea of available content to give you only what you want to watch. Let’s look at how they’ve managed to leverage personalization to create a unique experience for all of their 81.5 million subscribers. 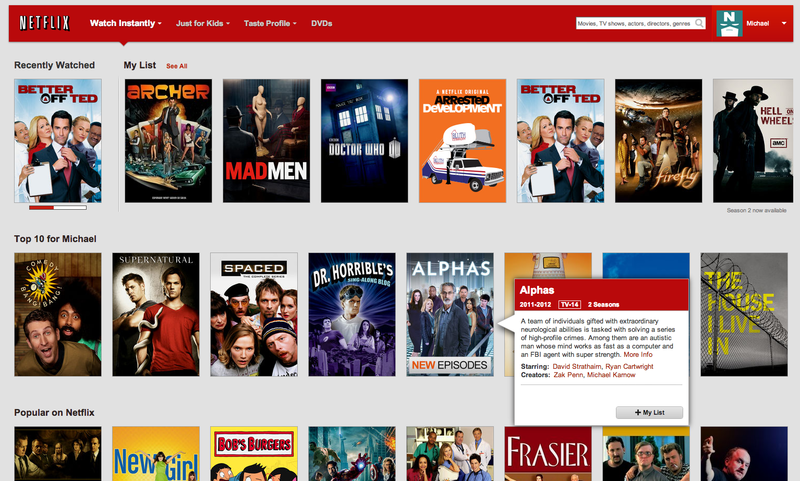 The “Recommended Shows” sections of Netflix aren’t new. In fact, they were working on improving their recommendation algorithm when they were still mailing out DVDs. Way back in 2006, they announced a $1 million prize to any team who could help improve their recommendation algorithm by just 10%. It’s clear they’re serious about constantly improving recommendations, and things have only gotten better for them since they made the jump to streaming in 2007. Compared to a DVD watch list, instantly streaming content gave them a lot more data about people’s viewing habits. While they only had a list to work with in the past, now they can see what shows you watch, how much of each show you watch, what time you watch, and a lot more. This knowledge about your viewing habits helps them keep you engaged by ensuring you always have something new to watch. Once Netflix made the jump to streaming, it opened up a whole new platform to reach new potential users. The thing is, not everyone’s the same, and different people prefer to watch movies or TV on different media. Netflix quickly understood this dilemma and saw the potential to have their service on different platforms. Rather than just being available through their site on a PC, they opened it up to Roku, Xbox, Apple TV and many others. Netflix has one thing down: they are available to personalize content wherever and however their customers want it. From laptops, to phones, and even gaming consoles, Netflix is available wherever you want to use it. The last piece of personalization that helps Netflix deliver a seamless customer experience is by now bringing recommendations right to your inbox. They knew people spent a lot of time just browsing for something to new watch, so now they help out by emailing suggestions directly to you. By using all of the data from your account, if a new show or movie that they think you’ll like comes out, they’ll let you know. You can even add it to your list from your phone! Delivering useful content and recommendations is the type of omni channel personalization that has separated Netflix from the competition. They’re able to deliver a seamless experience from start to finish. You may have heard of this company. They used to sell books online, but are now the largest marketplace in the world, and are a perfect e-commerce example for how personalization helped them dominate the marketplace. As an e-commerce site, they make their money by selling products, and make even more money by recommending other items. The motivation for recommendation is getting you to purchase more items. As the web grew, and more data points became available about their users, they were able to track more and more information, and make appropriate recommendations. The company reported a 29% sales increase to $12.83 billion during its second fiscal quarter, up from $9.9 billion during the same time last year. A lot of that growth arguably has to do with the way Amazon has integrated recommendations into nearly every part of the purchasing process from product discovery to checkout. 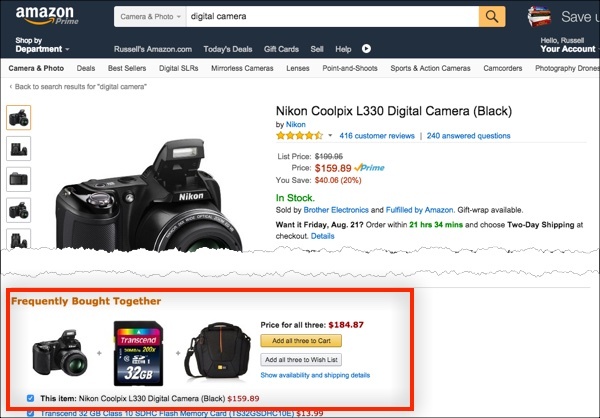 Not only does this work, but they have multiple areas, each offering different suggestions: frequently bought together, customers who bought this item also bought, sponsored products relating to this item, and what other items do customers buy after viewing this item. Those are four other suggestions to upsell and get you to buy more products. It’s no wonder why Amazon is the leader in the marketplace. This alone shows their understanding and value of customer data. If you’re running an e-commerce business, then you know that it’s a fact that a certain percentage of people will abandon their carts before purchasing. It doesn’t mean that they hate your brand or don’t want the product; life is complicated, and lots of things are vying for our attention. With nearly 44% of cart abandonment emails being opened, a good percentage of those result in sales. This kind of personalization and customer experience isn’t hard to achieve, and any e-commerce business should be doing it. All it takes is a simple email with the items they left in the cart to try and rekindle the relationship and emotion felt in the first place. This last product of Amazon’s takes personalization from the digital into the real world. If you’ve been following along, then you understand that people like to interact with brands on their terms, and that repeat business is key for a successful brand. Amazon took their one-click checkout feature and made it into a real button. They realized that certain people would buy the same staples like Tide, Gatorade, or razors, so they made it even easier for you to buy them with one touch. Going from multiple steps to one press of a button is the next step in personalization and takes the customer experience to the next level. I’m excited to see what else they have up their sleeves. Not mentioned in the title, but equally as interesting is Best Buy, and they’re the last example of how a brick-and-mortar company can also adapt to the online data revolution and go toe-to-toe with the best of them. Worldwide, they have a 22% hold in the electronics market and are trying to close the gap with Amazon. To do so, they’re implementing similar tactics as Amazon and capitalizing on the shift to personalization. If you’ve bought something at Best Buy recently, you’ll notice that they too are sending recommendation emails. If you bought an Xbox and they have your email address, you might get emails suggesting new game titles you might like. Of course, Best Buy stores benefit from the ability to offer instant gratification, but they also separate themselves from other online retailers by offering store-exclusive content. That means if you preorder a game at Best Buy, you’ll get exclusive access to limited-edition content, not available to anyone else. With prices being pretty consistent for video games, offering the bonus of additional content is an interesting approach to helping close the gap with online retailers. Around 70% of Best Buy’s inventory is available cheaper elsewhere online (Amazon, eBay), so how do they still manage to compete? To combat this, they’ve implemented a pretty liberal price-match policy for brick-and-mortar as well as online retailers. This policy is a pretty bold statement and makes a strong case for those who prefer to buy all of their electronics at once to do it all at Best Buy. If online retailers can’t compete with price, then they’ll have to get creative to compete with Best Buy moving forward. Though brick-and-mortar can seem like an excessive overhead in our digital society, Best Buy uses it to leverage their “blue shirt” experts and staff, who give a real personal touch. This is something an online store just can’t do on the same level. Sure, they could have a pop-up live chat window, but it just can’t replace actual face-to-face, human contact. Their staff is well versed in what they’re selling (sometimes that’s because they are actually employees of the brands they are recommending, instead of being Best Buy employees), and can usually understand your concerns and make real-time recommendations. Though large businesses are generally not known for their speed in implementing change, all of these companies have done a great job of using data to their advantage to keep things personal for their customers and deliver an amazing overall experience. And as far as it looks, the customers have returned the favor by staying loyal to them and purchasing time after time.